The Cambridge Companion to English Literature, 1740-1830, edited by Thomas Keymer and Jon Mee, The Cambridge Companion to English Literature, 1830-1914, edited by Joanne Shattock, and The Cambridge Companion to Victorian Culture (2010), edited by Francis O’Gorman is yet another useful collection of smart, lucid, and engaging essays by British Victorianists. Keymer and Mee’s volume covers, in two parts, the context and modes, the writers and their circles of correspondence, and other traditions of English literature from 1740-1830. In part one we are introduced to readers, writers, reviewers and the professionalization of literature (Barbara M. Benedict); to criticism, taste, and aesthetics (Simon Jarvis); to literature and politics (Michael Scrivener); to national identities and empire (Saree Makdisi); to sensibility (Susan Manning); to English theatrical culture (Gillian Russell); and to the Gothic (James Watt). 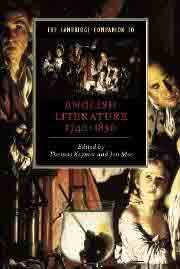 Part two focuses on different writers and their works, such as Richardson, Henry Fielding, and Sarah Fielding (Pater Sabor); Johnson, Boswell, and their circle (Murray Pittcock); Sterne and Romantic autobiography (Thomas Keymer); Blake and the poetics of enthusiasm (Jon Mee); Barbauld, Robinson, and Smith (Judith Pascoe); Wordsworth and Coleridge (Paul Magnuson); the invention of the modern novel (Kathryn Sutherland); Keats, Shelley, Byron, and the Hunt circle (Greg Kucich) and John Clare and the traditions of labouring-class verse (John Goodridge and Bridget Keegan). 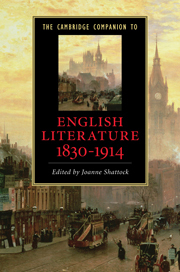 Shattock’s volume offers “fresh perspectives on a literary period bounded at one end by the Romantic movement and by Modernism at the other.” The volume begins with a consideration of the status of authorship and the gradual professionalization of writing from the 1830s (Josephine Guy), then turns to the reader and the consumption of literature (Mary Hammond). The following essay emphasizes the variety of “life writing” in the period 1830-1914 (Alison Booth). As Shattocks notes in her introduction, “biography as we know it was largely the creation of Victorian biographers.” The growth of nineteenth-century periodicals are linked with the “increased opportunities offered to women writers” (Susan Hamilton). Another essay reminds us that “‘the past as we know it was largely created by the Victorians,’ that historical terms and concepts and the idea of periodicity were invented in the nineteenth century” (Hilary Fraser). There follows an essay on “radical writing,” covering the literature against the Poor Laws of the 1830s, the impact of Chartism, and the emergence of the Socialist movement in the 1880s (Sally Ledger). An essay on “popular culture” looks at the ways artists, critics, and audiences responded to a “fractured and contentious” Victorian national culture (Katherine Newey). In another section, one author writes about the “new cultural and political importance which science acquired during the nineteenth century” (Gowan Dawon). Another focuses on the ways in which medical discourse “influenced the work of novelists and also poets, in their attempts to render legible the inner, emotional life” (Jenny Bourne Taylor). The growing acceptance of gradual evolutionary processes, moreover, led to an increasing fascination with the “other,” particularly in terms of religion, and is widely displayed in the religious diversity of nineteenth-century novels (Andrew Sanders). A final essay in this section focuses on Victorian “visual culture,” the “creative cross-over” between literature and painting, and the “desire to be able to picture, and consequently observe, every detail of the physical environment” (John Plunkett). We must not claim to know too much; we must retain some scepticism and readiness to change; be doubtful of what look like accepted terms that have not been thought about for a long time; in particular be doubtful about metonymy, about making single events or instances stand without qualification for larger wholes; be doubtful of coherence that persuades only because it is coherent; be wary of plausibility that resides only in rhetoric and not in the concepts and the rhetoric is struggling to describe. To this end, Gorman argues that his collection of essays assume that “‘Victorian’ is defined as a post hoc category, an idea that exists in the critical analysis of critics subsequent to its end.” It is a continually redefined label, by “critics examining different aspects of an exceptionally diverse set of possible knowledges.” The first essay aptly begins with the “age of scientific naturalists; the shift of authority in University education form the Anglican establishment to the men of science; the assertion of the experimental method; [and] the professionalization of science and its division into the disciplines and sub-disciplines that are still familiar today” (Bernard Lightman). There follows appropriately an essay technological innovations, particularly in the realm of communications technology (Nicholas Daly). Another essay discusses Victorian business and economics (Timothy Alborn). It is also worth remembering that “warfare…was an almost constant feature of Victorian life” (Edward S. Spiers). Just as prevalent was music, both public and private (Ruth A. Solie), and the theater (Katherine Newey). 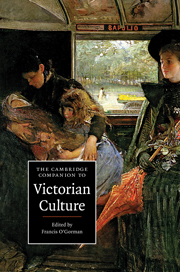 A related essay discusses how the notion of “popular culture” arose as a “realm of strategic contest through which the masses themselves were shaped in accord with middle-class interests and values.” But by the end of the century, “Victorians saw this edifying conception eroded not only by the acknowledged influences of the lower classes on English culture but also by the boom of consumerism” (Denis Denisoff).